Kids 1st - Kids 1st Rake Lane Rocks! Kids 1st Rake Lane Rocks! Nikki and Katy, two of our Kids 1st Rake Lane parents have been taking part in the new craze to sweep the North East. They have been hand decorate stones and rocks and hide them for children to find. Our preschool children have also been coming into nursery and talking about this activity, so to extend upon this very current interest, our preschool team have decided to launch their very own version of “Rake Lane Rocks”. We are inviting all preschool parents to paint a rock with their child and bring it into nursery. Our aim is to then hide the rocks within the local area and ask parents to take photographs if and when they spot them. 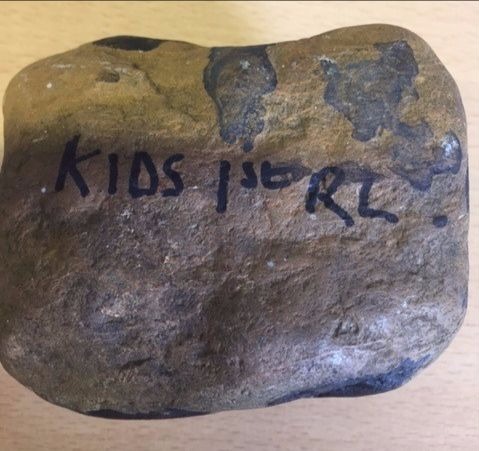 To make the rocks easy to identify, we are asking parents to write “Kids 1st RL” on the back of the rock. We will also be running a competition for the best rock with a winning prize of a £15 Toys R Us voucher and one day’s free childcare. We are really excited about this event and ask that all entries are submitted no later than Friday 30th September. We will also be posting photographs of the rocks as and when they come in on our Facebook page so please keep an eye out for your entry! Good luck and remember, Rake Lane Rocks!